The Atlantic Council, with support from the Bob Woodruff Foundation, launched the Take Point Initiative (TPI) in 2014 to support post-9/11 veterans transitioning to careers as nonprofit and thought leaders in the policy field, and provide them with a voice in key discussions shaping American foreign policy, national security, and the narrative around veterans in America. The 2016 program offers two distinct fellowship tracks for applicants – Nonprofit Leadership and Thought Leadership (for projects such as research papers, publications and documentary films that are not technically nonprofit organizations). 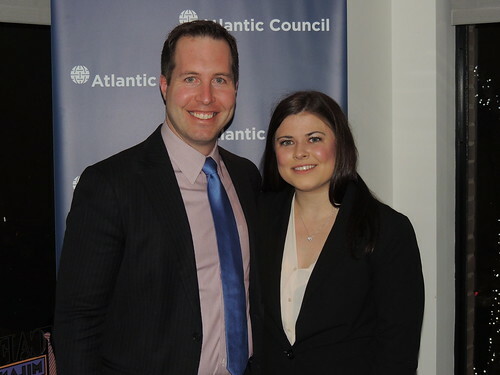 The Atlantic Council, in partnership with the Bob Woodruff Foundation, will award a total of $40,000 this year to support veteran-run projects by fellows along these tracks. Grants will be awarded at the end of the fellowship via a competitive pitch process. The 2016 Program will also feature a world-class curriculum of hands-on skills training, public events and speaking opportunities where fellows can distinguish themselves as thought leaders and intellectual entrepreneurs, and an exclusive retreat in partnership with Boulder Crest where fellows will have the opportunity to connect directly with senior officials in an off-record setting to discuss pressing foreign policy and veterans’ topics. Building on the strong success of the inaugural 2014 TPI fellowship, in 2015, the Council expanded the initiative to engage a broader community of veterans by adding a special thought leadership track for veterans with projects that did not qualify as nonprofit organizations, and by dividing the nonprofit track into two sub-categories: nonprofit startups and nonprofit accelerators. In 2015, the program also included a dynamic public events, including Capitol Telling which was organized in partnership with the Telling Project. Enhanced training included customized mentor matches and opportunities to network with potential employers and funders, deepen substantive policy expertise, and build nonprofit and thought leadership skills over the course of the ten-day program in Washington, DC. The Council awarded over $60,000 in grant funds to Take Point fellows in 2015 to support their work. In turn, fellows committed to using their training to help provide a voice for other young veterans in the foreign policy discourse, including injured veterans. You can view bios of our 2015 fellows here as well as review the program’s curriculum of functional trainings here, and master classes with senior leaders such as Governor Jon Huntsman and former US Secretary of Defense Charles Hagel here. The 2015 Program also included the expansion and pilot of a special Take Point University program geared specifically towards student veterans outside Washington, DC. Through this program, the Council awarded an additional $8,000 of micro-grants to student veterans in Los Angeles, Chicago, and Omaha. For more details, visit our Take Point University program page. Take Point’s inaugural 2014 fellowship focused exclusively on veterans seeking to launch or grow nonprofits that elevated the veteran voice in policy. The program featured a week of intense training designed to build the core nonprofit competencies, including strategic planning, nonprofit management, nonprofit finance and law, and communications. The first class of ten exceptional young veterans was selected through a highly competitive process, and included former officers and enlisted men and women who served in the United States Army, Navy, Marine Corps, and Air Force. Fellows met with high-level officials from the government, civil society, philanthropic organizations, and the private sector, including meetings with Atlantic Council Chairman Gov. Jon Huntsman, Gen. James Cartwright, former White House Counselor Pete Rouse, former US Secretary of State Madeleine Albright, and other senior Atlantic Council Staff, as well as nonprofit trainings by KNP Communications, Rubino & Company, Hogan Lovells US, and Georgetown and Indiana Universities. Following the week of training, fellows pitched their nonprofit projects to a panel of expert judges and the Atlantic Council awarded one $25,000 prize. A list of fellows from the 2014 class is available here.